We are located on a beautiful and peaceful 2 acre property, with tropical gardens and rolling lawns only 10 minutes from Coolum Beach on the sunshine coast. The cattery buildings have been purpose built with the comfort and happiness of our feline guests in mind. Our main focus is to keep our facility small and intimate so that we are able to provide personal attention to each of our visitors. With a maximum of 12 runs operating in each complex we can spend the time making sure our guests are settled and thriving on their holiday. ALL ENCLOSURES ARE HIGH -CLASS & WELL APPOINTED. Each spacious unit has it's own private outdoor run. Access to this is via a window which can be left open during the day and is closed at night for added protection. 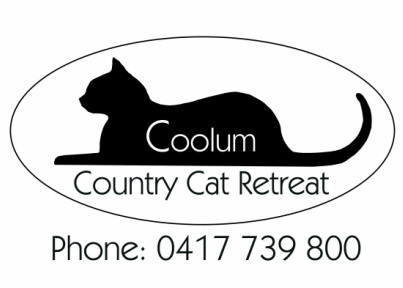 We anticipate our guests spending lazy afternoons lying in the sun enjoying the serenity, listening to the birds and having a very relaxing holiday at the Coolum Country Cat Retreat! You can relax too with the knowledge that your feline friend is being cared for by an experienced vet nurse. We keep daily records of your cats food intake and output thereafter. From this we can determine what changes, if any, need to be made to their diet or position within the cattery.